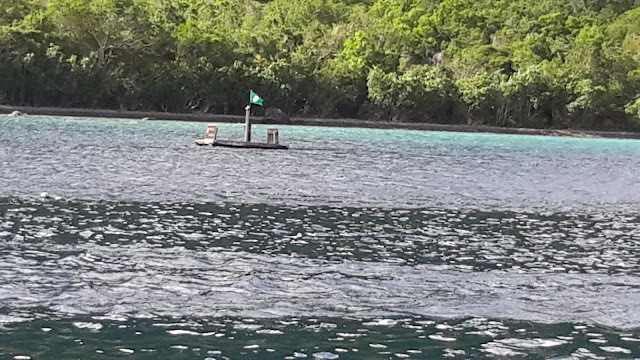 The cost to moor here is 1/4 the cost of mooring in the BVI , $7.50 with a US Golden Age passport (thank you Bob) vs $30 a night, although still more expensive than anchoring (free). 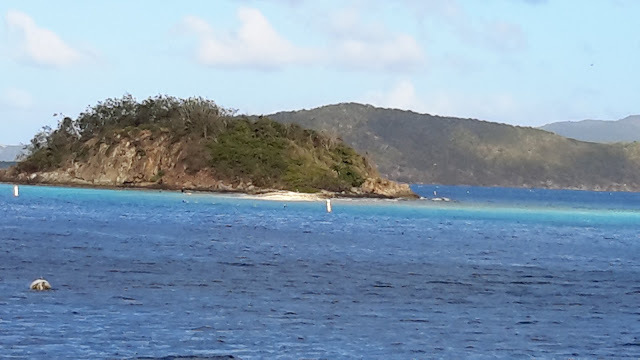 You enter the bay from the Sir Francis Drake Channel, the main "highway " of the BVI. As you turn to enter the bay, the wind dies down and gives the bay almost a lake - like quality, a rarity around here. There are not many boats here for a few reasons, the biggest being the lack of bars (or any facilities ) on shore. That tends to keep the numbers down, much to our delight. In addition, and because of this, the boaters that choose to come here tend to be a little quieter and a little calmer. As you enter the bay there is a small island that guards the entrance. It is ringed by bouys that warn boats of the shallow waters a reef surrounding the island. In those shallow waters is some excellent snorkeling, and you are quite protected by the bouys warning the boats away. There are several hiking trails leading from this bay. We have only explored one so far, with hopes of checking out more in the future. The hike that we took was to the former Anneburg Sugar Plantation. It is a well marked trail, and the plantation is filled with information placards about the running of the plantation, the everyday life there (very depressing) and the plants that you see growing there. This is our second time at Waterlemon Cay, and we already have plans to return here, at least once on this trip, and I am sure there will be more in the future. Pelicans swooping, butterflies flitting on the surface of the water, fish and sharks (ok one small shark- but it counts) in the warm water below. Now I am off to enjoy some of those charms.